Sometimes it seems so complicated, this being human. Especially now, in the 90s. Maybe it always seems difficult for those whose age it is, but certainly it is no less difficult now. Churches, governments, institutions, and families are all coming apart at the seams. There is a massive reconstruction going on socially, politically and culturally. We are fast becoming a global community. I can know what someone is having for breakfast in China, get them to fax me the recipe and have it myself for dinner the same night. In one day I can fly home sneezing from a cold caught in Russia, watch someone gunned down in a live telecast from Bosnia, adopt a rain forest in South America, and buy Florida oranges from a Mexican American at a Los Angeles Freeway offramp, never exiting my car, which was assembled in sections on at least three different continents. What can I know of such a world? What can I know about myself in such a world? What can I know about you? And so, we talk. Dialogue has got to be the biggest growth industry for what remains of the century. From Internet to National Public Radio, the opportunities for conversation are exploding. People want to know about each other. They want to know about themselves. From reality programming where TV becomes the national town square sharing gossip and information, traveling at the speed of light down optic fibers, to magazines clearly labeled “People”, “Self”, “Us” and “Interview”, we are trying to get to know one another and ourselves. Art too is in a process of dialogue. 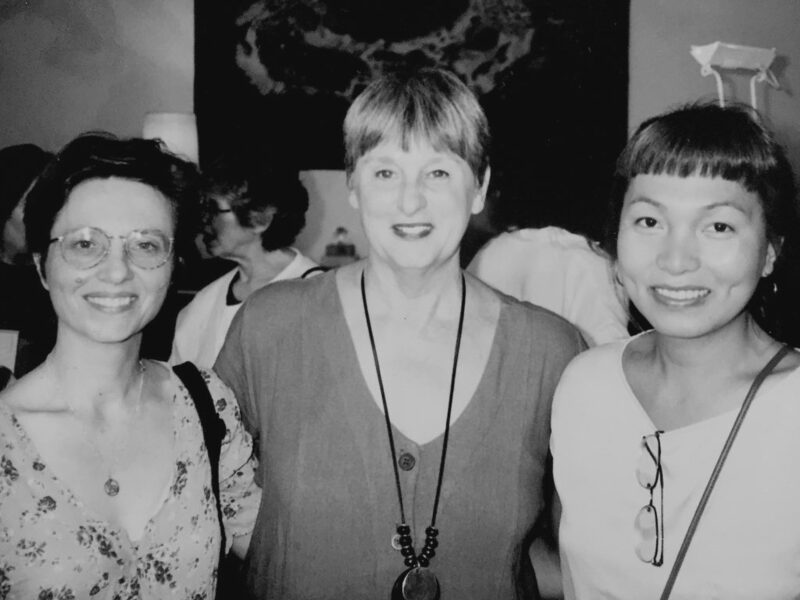 During the 1980s feminist scholars challenged the humanist notion of a unified, autonomous subject which had dominated the arts since the Renaissance. They demonstrated that there was no single experience of being male or female, only gender representations. They took apart the idea that any one culture spoke for all cultures, or that any representation contained absolute “truth” for all humanity. In part they did this by looking at the power structures at play in languages, both written and visual, which represent or encode reality. The result has been a growing cynicism and distrust of all means of communication, including art. Postmodernism suffers greatly from its inbuilt mistrust of language’s codes. Constant analysis of the way economic, social and political powers fix and maintain themselves and their worldview has made many tests completely skeptical about their ability to say anything and contaminated by prejudice, or art’s ability to speak to anyone outside the artworld’s corridors. Having found all expression to be biased by culture, gender, or economics many artists have given up feeling that art can even address the large, most pressing question of this or any century – what it means to be human. (It’s a pessimism society, unfortunately, shares with its artists. No wonder so many people feel that there is so little they can do to mitigate the confusion of the fast transforming global society). Yet we keep talking. There is something within the process of dialogue that human beings instinctively try to summon for themselves. This is naming. The power of language to change the world. It is an awesome power and it is both active and reflective at the same time. Women Beyond Borders is about dialogue. It’s a gathering together of women so they can identify themselves, which is – speak for themselves. It is an opportunity for reclaiming identity on a global scale by looking at the codes of self imaging in various cultures. The importance of this action in a global society cannot be under estimated. Dialogue which begins with the silent, speaking for themselves, expressing who they are, their experience or their desires, opens an avenue for exchange and communication. It is an opportunity to alter and inflect the ongoing dialogue of signs and symbols which seek to define who we are. It is in a very real sense a revolutionary act. In America we have become accustomed to women speaking out, having our words weighed, our presence recognized. Although, in truth, this recognition is still mostly confined to white, upper and middle class women, still there is a general perception that all women are entitled to this kind of presence in the world. But this is not the experience of women internationally. And certainly not of its women artists. Women Beyond Borders is a step in undoing the isolation and hopelessness of silence. It is not a panacea, a goal or a Band-Aid. It is simply a step. Next will be the visits between artists in various countries, the letters and the Internet communications. These are interpersonal communications which will be followed by more self exploration, expansion of presence, and confirmations of global and community importance. Although we are invited to witness these exchanges by viewing the various exhibitions, unless we actively join the discussions most will be invisible to us. Documentation will never fully reveal what this dialogue will mean to the participants. That is to be expected, and in no way diminishes what this gathering together will signify to the world. Because every revolution is people. Not crowds, or movements or armies, but individuals coming to a common understanding that they have power. That they can change the world. And it always begins with knowing who we are.